Industrial resource mining looks–and acts–much like warfare. That was the stark impression created by the exhibition of Unearthing Disaster I & II, by acclaimed artists and activists Angela Melitopoulos and Angela Anderson at San Francisco’s Minnesota Street Project. The Institute of the Arts and Sciences presented the eponymous videos in Spring 2017 to coincide with the Extraction research project at the University of California, Santa Cruz. Extraction: Decolonial Visual Cultures in the Age of the Capitalocene, was co-organized by T.J. Demos of the Center for Creative Ecologies and artist A. Laurie Palmer, and featured artist lectures, field trips, film screenings, and a culminating conference critically analyzing the current ecological conditions created by late capitalist modes of industrial resource mining. The interlinked academic events and activities investigated the social, political, economic, and aesthetic mechanisms that continue to drive these modes of production even as they cause catastrophic climate change. On one side of the projection screens, eerie and disturbing imagery of the vast environmental devastation that open-pit mining is wreaking on the Greek landscape moves between the two screens. A camera pans across a bleak landscape in which huge machines turn pristine forests into barren pits; close up footage of trees choked by heavy white dust flicker across the screens; and a powerful soundtrack of heavy machinery punctuated by the evocative sounds of a solo violin fill the darkened gallery. 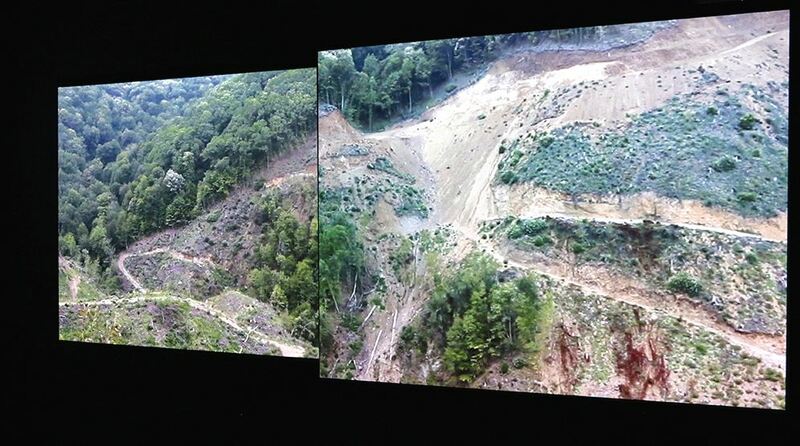 On the other side of the projection screens, images of environmental destruction are juxtaposed with images of profound state violence. Graphic scenes show citizens protesting against the mining operation and being tear gassed and beaten by police, police marching in ranks through a small town in a show of military force, and people fleeing from tear gas, rubber bullets, and flares. In one horrifying moment, a man falls to the ground and disappears into a dense circle of police officers swinging nightsticks. 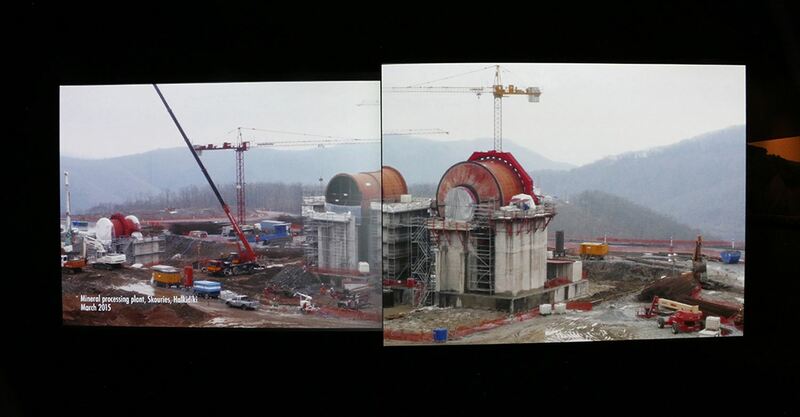 Together, these scenes of environmental devastation and state violence form the urgent questions at the heart of Unearthing Disaster I & II: Why is the state assisting a private, international mining company in laying waste to forests, mountains, and communities in Greece? And, as images shows the state turning its weapons against its own people, how did industrial resource mining lead Greece into what looks remarkably like a civil war? 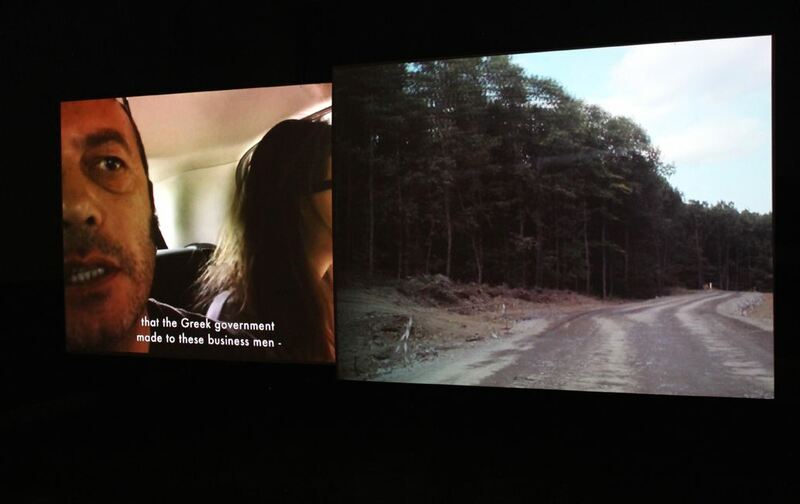 Unearthing Disaster I (originally titled Corridor X - Postscript to an Unfinished Journey), a 36-minute double-screen video installation, probes these questions by providing a graphic overview of the current eco-political struggle underway in Greece. The video opens with old scenic found footage filmed from a car traveling along a roadway in a pristine mountain landscape on the Halkidiki Peninsula, near Thessaloniki in northeast Greece. The camera focuses on the rolling hills and forests which line the narrow road. That bucolic scene is quickly replaced with more jarring footage; heavily armed police attacking protestors on the same rural mountain road in 2012. In the year before, captions explain, Eldorado Gold, a Canadian mining company based in Vancouver, acquired the rights through a “fast track” investment program to clear-cut a large swathe of the old-growth Skouries forest in Halkidiki and reengineer the local water system in order to build a massive open-pit gold and copper mine, along with a processing plant, and a large underground mine. This investment program was part of the concessions Greece was forced to make to the European Union because of the debt crisis that enveloped the nation in late 2009. In the spring of 2010, when Greece was veering toward bankruptcy as result of the debt crisis, the international economic powers called the “Troika”–the International Monetary Fund (IMF), the European Central Bank (ECB) and the European Commission–issued the first of two international bailout loans for Greece. The bailout loans came with conditions. To avoid bankruptcy and the collapse of the state, Greece was made to accept harsh austerity terms, including deep budget cuts and steep tax increases. Further, lenders required Greece to “improve the competitiveness” of the nation’s economy. Sharp reductions in wages and salaries and the elimination of collective bargaining agreements were required, as well as massive deregulation and the accelerated and barrier-free licensing of large-scale private investment projects such as Eldorado Gold. In other words, the Greek government was made to dismantle the welfare state and privatize the nation’s resources, prioritizing “development” over both social and environmental impacts. The footage captured in Unearthing Disaster I from October 2012 begins to show the results. Images moves across the two screens of the more than two thousand residents who gathered on the road leading to the mines in protest, evidence that Greek citizens and works did not simply accept the neoliberal reforms. They also reveal the police with helmets, nightsticks, and gas masks who were there to meet them. The disturbing archival footage shows police bearing body shields and shooting teargas canisters into the crowds of protestors as people clutching signs and banners scream and retch, fleeing from swinging nightsticks and clouds of teargas. The video cuts to 2013, and the installation begins to draw out the broader–if similarly violent–social and environmental effects of this forced privatization. The filmmakers accompany two local activists along that same road to the open pit mine months after the protest on the mountain road was harshly subdued. Recorded within the close confines of the car bearing the filmmakers and the activists, Elli Damaskou and Ioannis Deligiovas describe what, as Deligiovas bluntly says, “is wrong with the plan,” and why protests against the mine continue to escalate. From the deforestation that precedes opening the mine, leading to loss of forest cover and loss of habitat for the wildlife living in the region, to the air pollution, water pollution, and loss of soil fertility that accompany the extraction of minerals from the deep pits, the ecological effects of open pit mining will be dire, Deligiovas and Damaskou take turns explaining. On the peninsula of Halkidiki, where the economy of the region relies on bee keeping, fishery, forestry, farming and tourism and where the majority of the water comes from mountain springs, the livelihood of entire communities and the future of the entire biodiverse area is under threat. Even before subsequent video shows police officers stopping the car to try to bar the filmmakers from documenting the destruction of the forest, Unearthing Disaster I has provided an answer to the activist’s poignant question. Political theorist Maurizio Lazzarato has diagnosed the demise of democracy in the current conditions in Greece. He writes, “contemporary democracy has been circumvented by techniques of transnational governmentally whose active basis lies in finance capital.” From the nightmarish footage of the Greek police violently confronting citizen protestors to the subsequent images of a forest in ruins, Unearthing Disaster I lays bare the realities of this “circumvention.” Like the Skouries forest, democracy in Greece is seen to be in ruins, with the Greek state currently at war against its own people while protecting the multinationals that are laying waste to its lands for corporate profit. It is what the activist says next, however, that sets up the critical intervention made in Unearthing Disaster II. In the months since she was rendered speechless by the site of the ecological devastation, as seen in Unearthing Disaster I, Damaskou explains, she has grown accustomed to the ravages. As she puts it, being at the site of the open pit mine used to make her violently ill, but she finds herself growing inured, even able to “eat a sandwich” in the midst of all the ruin. When she says next, “if we don’t find a way to stop this, we will all be dead,” it is unclear whether she means the environmental wreckage or the normalization of the disaster. What is clear, as the screen fades to black, is that Unearthing Disaster II is intent on stopping both the physical forces that drive climate crisis and the forces of perception that normalize these circumstances and allow them to thrive. After that brief introduction, Unearthing Disaster II is largely devoid of words and of people. Instead, an evocative soundtrack featuring a single violin and the noises of heavy machinery as it digs deep into the earth in the Skouries forest is all that is heard. Images of the machines leveling the mountain, of trucks bearing loads of dirt, and closeups of the pools of wastewater fill the screens. This footage of the workings of the open pit mine are juxtaposed with scenes of what is left of the trees that formerly thrived in the mountains. Trees that are dusted with white silt from the mines are shown still to bear fragile new buds. The camera focuses on the trees limbs with their delicate growth, emphasizing the struggle for life still underway in the demolished landscape. At the very end of the video, the activist’s voice again fills the room. She asks, “how can we live without the forest?” The camera focuses on a small stream rushing past the trees, murky with the run off from the mines. And, what is truly at stake is brought strikingly into focus. The interlocking connections between the crisis of democracy and the social breakdown in Greece–– conditions which are now spreading throughout the globe––are shown to be the erosion of the web of life. In Unearthing Disaster I and II’s bleak and stirring overview, the violent collapse of democracy heralds not only the destruction of civil society, but also the continuing escalation of the climate catastrophe that is currently enveloping not only Greece but also the world. Rachel Nelson is curator and program manager of the Institute of the Arts and Sciences at the University of California, Santa Cruz. She also teaches in the History of Art and Visual Culture department. She writes on the intersection of contemporary art and globalization, with a particularly focus on how artists from the global South articulate the ethno-racial dimensions of global politics. Nelson has a PhD in Visual Studies from University of California, Santa Cruz. She has published in NKA, Third Text, Savvy, and African Arts. The Institute of the Arts and Sciences (IAS) of UC Santa Cruz presented Unearthing Disaster I & II, curated by John Weber, at Minnesota Street Project May 20- June 24, 2017. The IAS is an interdisciplinary exhibition and event forum in the Arts Division of the University of California, Santa Cruz. The IAS offers a range of public programs, sponsors residencies, and curates and organizes an ambitious exhibition program. In 2013, Euclid Tsakalotos, the current Deputy Finance Minister and economic spokesperson after the election of the Coalition of the Radical Left party (Syriza) in 2015, and economist Christos Laskos, published a book sketching out the causes of the Greek Debt crisis, the terms of the bailout, and the effects of the imposed austerity measures on the Greek labour system. As they put it, the crisis provided the “opportunity to finish the neoliberal modernizing project in terms of reducing wages and pensions, dismantling labour protection, and undertaking an even more radical program of privatization.” Christos Laskos and Euclid Tsakalotos, Crucible of Resistance: Greece, the Eurozone and the World Economic Crisis (London: Pluto Press, 2013). “Greece EFSI: When it is Needed Most.” European Investment Bank, October 26, 2016. This is not the first time that transnational pressure has been brought to bear on the Greek economy, forcing Greece to capitulate to neoliberal reforms. Between 1948 and 1952 the European Recovery Program (ERP), known as the Marshall Plan and instigated by the United States, provided direct financial and material aid to the Greek economy after the destruction of World War II and the Greek Civil War. The Marshall Plan had a “politics of productivity” similar to the terms of the 2010 bailout; it required industrial rationalization, new management and marketing methods as well as international trade and open borders. Unearthing Disaster I references this longer history. Activists explain that the area currently being developed by Eldorado Gold has been defined by law as a “mineral area” for decades. This designation makes the area susceptible to the “mining act,” a law, activists explain, that is is practically more powerful than the constitution in effect. In mineral areas, land can be confiscated “in the interest of the nation” without going through the normal processes to expropriate land. Apostles Vetsopoulos, The economic dimensions of the Marshall Plan in Greece, 1947-1952, Doctoral thesis (London: University of London, 2002). Elli Damaskou and Ioannis Deligiovas are activists working in coordination with the Struggle Committee of Magali Panagia. Maurizio Lazzarato is Angela Melitopoulos’ long term collaborator. They collaborated on Assemblages (2010-2012), a long-term audiovisual research project on Félix Guattari and his revolutionary psychiatric practice and his political activism, as well as his ideas concerning ecosophy and interest in animism. Lazzarato wrote this after the left-wing Syriza government, elected in opposition to the neoliberalism alignment of the government in Greece, was made to capitulate to the demands imposed by European creditors. The demise of democratic governance that is foretold in Unearthing Disaster seems to have been made even more inevitable after a government elected to resist the capitalist developments in Greece succumbed to them. Maurizio Lazzarato, Governing by Debt, trans. Joshua David Jordan (New York: Semiotext, 2015), 237. Angela Melitopolous unveiled a stunning four-channel video and sixteen channel sound installation called Crossings, 2014 (109 minutes) at documenta 14, 2017, the mega exhibition of art held in Kassel, Germany every five years. Crossings (made with contributions from Angela Anderson, Maurizio Lazzarato, and others) represents a continuation of Unearthing Disaster I & II, in that it investigates the history of social and environmental exploitation in Greece, connecting it as well to the current European crisis of migration. For an extensive discussion of Crossings see: T.J. Demos. “Learning from documenta 14: Athens, Post-Democracy, and Decolonisation.” Third Text, August 23, 2017.